Acupuncture is an ancient therapeutic technique that involves the comfortable insertion of small, acupuncture needles at target sites along the body. Acupuncture can be used to decrease pain, promote tissue healing, relieve muscle tension, encourage proper muscle activation and improve overall body functioning. 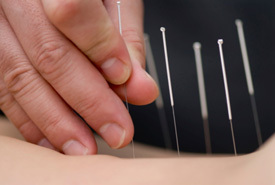 Acupuncture works by stimulating changes in the local tissue, as well as the nervous system. The nervous system is the body’s master control system, consisting of the brain, spinal cord and nerves. Acupuncture triggers a cascade of chemical events in our master control systems, which promotes therapeutic effects including pain relief and tissue healing. Acupuncture sessions may consist of a small number of needles, and last just a few minutes, or they may be more comprehensive, lasting up to one hour. Most people experience a variety of post-session feelings, which range from energized to a deep sense of relaxation and well-being.